The rhinestone decoration program is an efficient solution for the simple and easy production of paste/stone patterns using a milling machine. The program converts vector data from lines and contours into rhinestone patterns. For this it supports different modes for the arrangement on the lines or in the area. The program can be applied very universally in 2 steps. Step 1 Calculation of the rhinestone points along lines or within contours. Step 2 Conversion of the rhinestone points into circles or drilling cycles. The rhinestone points can be edited manually beforehand. Selection of the functions for the rhinestone point calculation.General procedure is the calculation of the rhinestone points (Step 1). As required a manual editing of the points and the subsequent conversion into milling paths (Step 2). The calculation of the rhinestone points. The functions Rhinestone sections, Rhinestone areas, Rhinestone grid, Rhinestone area functioncan be selected for point calculation. The rhinestone points created using these functions are saved in a target layer. This target layer may not be modified after the calculation, because the following functions for the calculation of circles or drillings use only points from the target layer. Point arrangement along sections and contours. This function allows the use of open lines and closed contours. Point basic separation [mm]: Basis separation of the rhinestone points. This separation can vary, if length adjustment <> no adjust. is selected. Point minimum separation [mm]: If points lie more closely together than the minimum separation, then the points lying too close together are removed. Length adjustment: Matching of the point separation to the length of the sections/contour. For a separation factor <> 1.0 no length adjustment takes place. No adjust. The specified Point basic separation is maintained. Proximate The separation is increased or decreased, so that a whole- number arrangement can be achieved. For this the nearest distortion of the point separation is selected. Lengthen sep. The separation is increased for a whole-number arrangement. Shorten sep. The separation is reduced for a whole-number arrangement. Separation decreasing(<1), increasing (>1): Factor of the change of the point separation along the line. The factor = 1.0 leaves the separation unchanged. A factor < 1 reduces the point separation, a factor > 1 increases the point separation with every object. For a separation factor <> 1.0 no length adjustment takes place. Target layer [0..LayerMax]: The rhinestone points are saved in this layer. Point arrangement along lines (hatching) or contour parallel. This function allows the employment of closed contours only. The hatching or contour parallel lines have a constant separation. Filling: Areas can be filled using the filling method hatching or using contour parallel lines. Hatching: Filling using hatching lines. Track parallel: Filling using contour parallel lines. Hatching angle [°]: Angle of the hatching lines with Filling = Hatching. Contour offset [mm]: Optional contour displacement inwards for hatching lines. This ensures i.a. that a hatching line is not placed too near to a contour. With contour [Y/N]: With YES, rhinestone points are also created for the contour(s). Point minimum separation [mm]: If points lie closer than this minimum separation, then the points lying too close together are removed. Length adjustment: Matching of the point separation to the length of the section/contour. No adjust. The specified ‘Point basic separation’ is maintained. Point arrangement in the grid within contours. This function allows the employment of closed contours only. The grid baseline separations in X and Y can be selected to be different. Area with random = 1, separation factor X/Y = 2. border with constant separation. Lines separation Y [mm]: Separation of the grid lines (Y separation). Separation factor X/Y [0.1 .. 10]: Modify the separations. The factor 1.0 leaves the separation unchanged. A factor < 1 reduces the point separation A factor > 1 increases the point separation with every object. Grid rotation [°]: Rotation of the point grid within the contour(s). Random Start [0..100]: Generation of random values for the separation creation. 1..100 Random generation using the given start value. With contour [Y/N]: With YES rhinestone points are also created for the contour(s). Target layer [0..LayerMax]: The created rhinestone points are saved in this layer. Point arrangement in spirals, circles or rays within contours. This function allows the employment of closed contours only. Shape: A spiral, circles or rays can be selected emanating from the centre of the shape. Spiral: A spiral is created. Track separation [mm]: Separation of the spiral rotations or the rays. For rays the separation is maintained at the outer radius. Determine centre [Y/N]: Determine the centre for spirals or rays. YES: The centre of the area is calculated automatically and lies in the centre of the contours. NO: Following input of the data the point centre can subsequently be input manually using the cursor or the keyboard. Point basic separation [mm]: Basis of the rhinestone points. This separation can vary, if Length adjustment <> No adjust. is selected. Length adjustment: Matching of the point separation to the length of the sections/contour. No adjust The specified ‘Point basic separation’ is maintained. Proximate The separation is increased or decreased, so that a whole-number arrangement can be achieved. For this the nearest distortion of the point separation is selected. The calculation of milling data from rhinestone points. Milling data are calculated from the rhinestone points placed in the target layer. The target layer was determined using rhinestone calculations and only displays the following inputs; it can no longer be modified. Circles are created from the rhinestone points in the target layer. Circle diameter [mm]: Diameter of the circular object to be created. Target layer: Display of the target layer. The layer can no longer be modified here. Drilling cycles are created from rhinestone points in the target layer. Max. layer depth [mm]: Maximum milling depth, which is carried out using this tool in one layer (infeed). This setting is employed for vertical drilling cycles and drilling circles. For a simple vertical drilling in one run max. layer depth is to be set to a value >= of the tool incision depth. Chip breaking lift [mm]: Chip breaking movement (peck drilling) for vertical drillings (not for drill circles). A chip breaking lift serves for the breaking/ripping off of a drilling chip. This property cannot be used for milling. Fordrillings, after a layer depth (setting max. layer depth), move upwards by the value given in the chip breaking lift (the chip is broken). After this there follows the movement to the next layer depth. Clearance offset [%[CuT]]: Separation for an additional clearance run. With 0 no clearance takes place. This setting can be used for drill circles only. Thesetting takes place in % of the tip radius (CuT). Typical settings are 10 .. 50%. Target layer: The milling data are saved in this target layer. The layer can no longer be modified here. Drilling diameter: Diameter of the drilling or the drill circle. A drilling diameter can only be selected as large as the tool diameter (2 x CuT). If the drilling diameter = the tool diameter then the program calculates vertical drilling movements. If the drilling diameter is greater than the tool diameter, then the program calculates drill circles, in order to obtain the desired drilling diameter. Working example for the rhinestone decoration program. Prepare graphic with closed contours. Graphic with rhinestone points. Fill rhinestone area using hatching. For this enter the values according to the graphic. Graphic with circles. Calculated from rhinestone point circles (milling data). 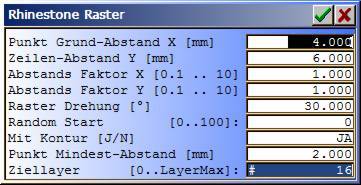 Select Layer 16 (target layer) as ActLayer and define a suitable layer tool. Enter, for examaple, using Extras . 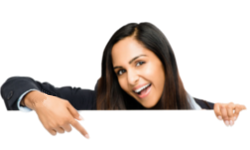 Tool input or with click-on [2D]. Export the milling data to your machine.